Watch the Movie Trailer for The Iceman. Michael Shannon, Winona Ryder, Ray Liotta and Chris Evans star in the true crime drama based on the book by Anthony Bruno and the HBO documentary. Appearing to be living the American dream as a devoted husband and father; in reality Richard Kuklinski (Shannon) was a ruthless killer-for-hire. When finally arrested in 1986, neither his wife nor daughters had any clue about his real profession. MPAA Rating: (R) for strong violence, pervasive language and some sexual content. 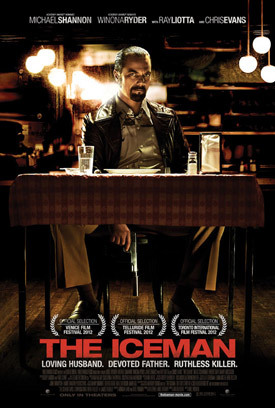 Inspired by actual events, THE ICEMAN follows notorious contract killer Richard Kuklinski (Academy Award(R) nominee Michael Shannon) from his early days in the mob until his arrest for the murder of more than 100 men. Appearing to be living the American dream as a devoted husband and father; in reality Kuklinski was a ruthless killer-for-hire. When finally arrested in 1986, neither his wife nor daughters had any clue about his real profession.